MAKING HIS third appearance in the Stroke of Genius series, Rafael Martinez rarely lacks in the creativity department. The grinder from Mexico has previously been featured for his imagination in the disciplines of 9-ball and one-pocket. But this time around, he's showing his capabilities in short-rack banks, the local flavor featured at every Derby City Classic. While his run to 27th place in the 2008 version of the Louisville tournament wasn't all that memorable, this shot against Louis DeMarco in the mid-rounds is worth revisiting. Need three more balls to take the set, Martinez banked the 2 ball into the lower left corner pocket. The trouble? His cue ball drifted to the point shown in Diagram 1. All four balls looked to be problematic at best. Of the three balls in the lower right, Martinez looked to see if he had an angle on the 3 ball, but his cue ball would be in the way of any attempt to send it cross-corner. The 1 ball was an option, but only if Martinez wanted to send it four rails. While commentator Danny DiLiberto went through a number of possibilities, he thought Martinez had an angle of "stiffening" the 1 and going one rail into the bottom left. But the way Martinez saw it, the 1 had to add another trip up the table. He banked the 1 ball two rails, a complete trip up and down the table, and into the top left corner. 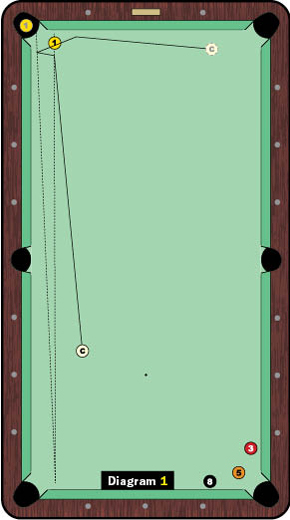 Needing to give the cue ball time to get out of the way of the 1, Martinez sent whitey off the long rail on its way to the top rail and into the position shown. The two-rail trick put Martinez within a ball of victory, which he would eventually get to top DeMarco in the case game, 3-2.